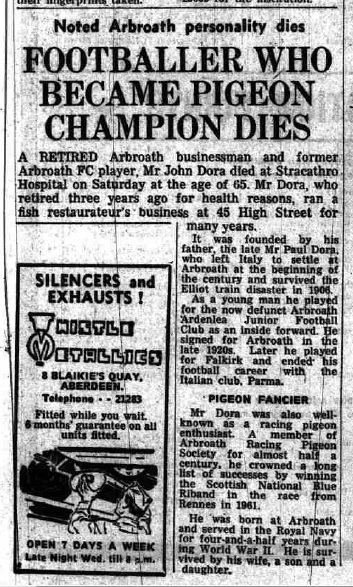 I wrote a blog post about John Dora a long time back, he was a Centre-Forward Falkirk signed from Arbroath who scored 2 goals in 3 games before breaking his leg and disappearing from the game. The very little information about him was confusing, for example the Falkirk Herald said he was Italian, while the Arbroath Herald had stated he was born in Arbroath but his parents were from Italy. Anyway, since his playing career was just under a century ago, this means that most of the usual sources [censuses etc] are still confidential, so I had sort of given up on finding more details without stumbling over it. So I was a bit surprised when I was sent an e-mail the other day, written in Italian and titled "John Dora o Giovanni Dorà" it linked to an article on the history of Borgotaro Football. 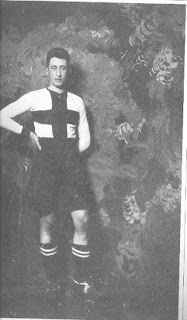 In one of the chapters it tells the story of Borgotarese player Giovanni 'Johnny' Dorà being called up to play in the Italian Championship for Parma in 1925. 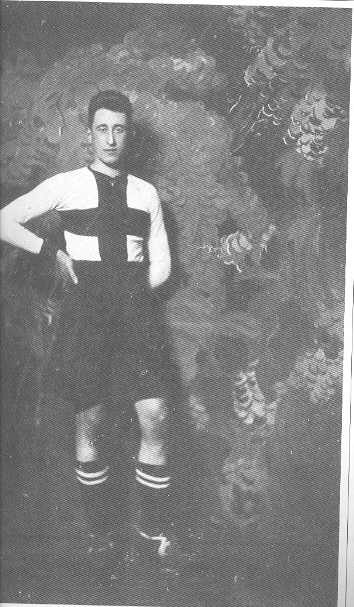 In the text of the article Johnny is described as "Tall, wiry, in his long stays in Scotland [he] had learned the game of foot-ball managing to graft into his Latin fantasy, the solidity and the concreteness of the British style." and that "Some time later, while in the newspapers there was talk of the interest of Bologna and Inter, Dorà returned to Scotland." [apologies for the translation]. So the Dorà that played for Borgotarese and Parma certainly had Scottish Connections but it is unclear where he was from, and even if this was the same person. but there is clearly something there. Crucially in the article there was a picture of a Johnny wearing a Parma top. 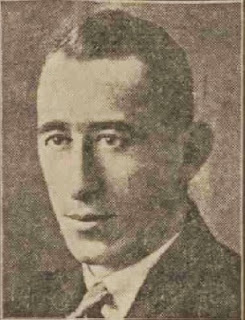 The best picture I have of John Dora was from 1930 and there are certainly facial similarities, although this could just be a family likeness. Last night I had a good dig about the internet looking for more info, and luckily Italian wikipedia had more, though it is interesting to note that the Italian Wiki is as flawed as the English one. Giovanni Dorà it claims was born in Borgo Val di Taro [Borgotaro] on the 29th of May 1905, and that he was a defender, however on a website on the history of Serie A where line-ups are given, he is only ever listed in the Inside-Left or Centre-Forward positions [even though by this time Italian Football was under the influence of the Danubian School, it was not so radically different that a number 10 was playing in defence]. So there we are, in 1925 the Arbroath papers said that John Dora had joined Ardenlea from Parkhouse Half-Holiday, while the Italian papers are carrying reports of Giovanni Dorà joining Parma from Borgotarese: it was not unknown for Scottish-Italians to split their time between the two countries back then, it is well documented that Peter Cabrelli split his time between Scottish & Italian football. Until I find something definitive it will have to remain in the possibly category. I had a wider root about in the newspapers for more information, and found an obituary in the Press & Journal of 8 February 1971. Although it doesn't really clear things up, it backs up his birthplace as being Arbroath, but it claims that he ended his football career with Parma, rather than the other way around, of course he could have had two different spells at Parma! I have now had confirmation from the family that the date of birth on the Italian Wikipedia page is correct, however the place of birth was incorrect, he was indeed born in Arbroath. Scored a Hat-Trick on his Debut.